A unique off the grid experience, there really is nothing quite like it. 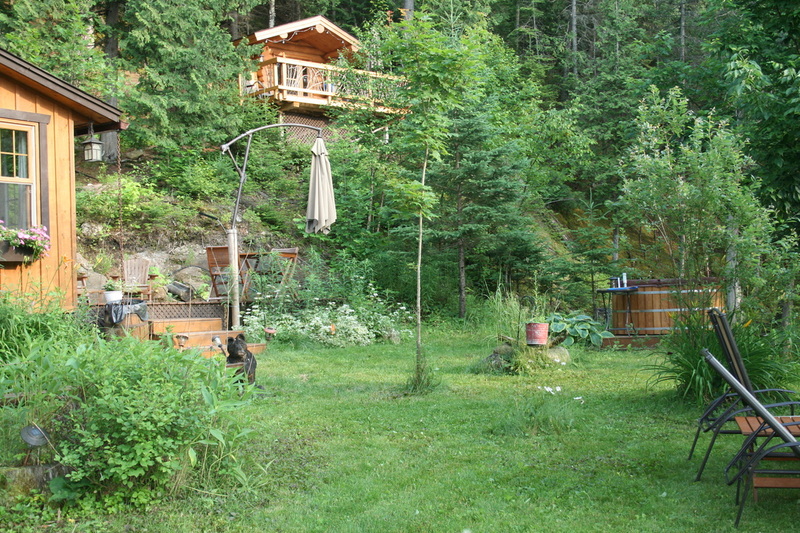 We are located about 30 minutes from downtown Ottawa in the Gatineau Hills of Quebec, 230 acres, very private, This cabin is only for two people. We are geared to an adult property. The real Canadian experience, an authentic darling little 600 square foot log cabin in the middle of the woods by the edge of a tiny lake off the grid. You are the only one on the lake! Totally private. 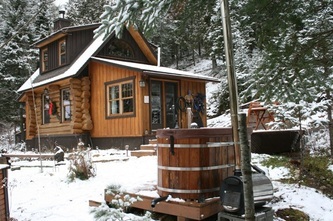 The cabin and log sauna were built on site from white pine logs that were cut within 500’of the cabin.The cabin comes fully equipped. Power is supplied by the sun. Four solar panels and 6 batteries supply enough power for your lights, music, (not hair blowers). There is a backup generator if the sun is not co-operating. The Kitchen is 7 by 11, with a small 4 burner propane stove and oven and a mid size propane fridge with tiny freezer. There is gravity fed running cold water at the sink in the summer which we collect in reservoirs from a underground source in the spring that dries up in the summer. Above the sink is a 2 gallon Berkey gravity fed water filter system for drinking water. Winter has a 7 gallon container on the counter, refilled from the spring at the side of the deck which runs all winter and what we use to fill the hot tub. All your basic spices, sugar, salt, flour, cooking oil, etc. are in the cupboards, lots of dishes,cutlery, coffee grinder, stovetop expresso maker, stovetop Milita drip coffee pot, pots and pans, almost everything you would have at your home. Feel free to ask if there is that specific item you need. The kitchen opens up to the back deck where you will find the BBQ and firewood. The main part of the cabin is 16' by 14', has a couch, pine table and chairs, wood stove and lots of games (click here for list of games), puzzles and assortment of books. There is an ipod player, blue tooth speaker and radio. Quaint decor and attention to detail. It is cozy, romantic and just delightful. A steep ladder/stairs leads upstairs to a large loft that has cathedral ceiling, skylight and lots of windows. 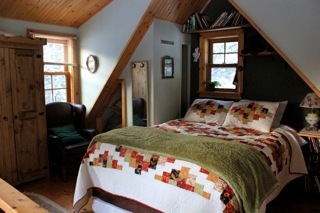 There is a queen sized bed, linens provided, pine floors and desk, armoire and chest of drawers. The back room serves as both a mudroom with couch. This room opens up to a large side deck with table chairs and umbrella. Just a few feet away there is an unbelievable 2 person wood fired cedar soaking tub, even in the rain and snow it is sheer bliss to be sitting in under the stars. This will have fresh spring water from the hill all heated up for you when you arrive. As an added bonus we now have a wood fired log sauna up the hill, it measures a generous 8x7' inside with two generous upper benches to stretch out on that are in an 8'x7' L shape and 28" deep! 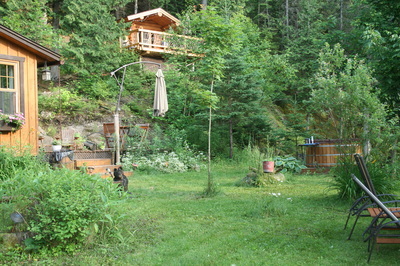 There is a large deck with twig railing overlooking the lake which is about 40' from the cabin up the hill. The lake is very small with pike, perch and catfish in it, a mud bottom… apparently there is that elusive big one that got away. There is a swim raft in the middle of the lake, a inflatable island, a couple of canoes, paddle boat and rowboat. There is a rock shore that goes out about 8' then drops to about 8'. Enjoy bonfires by the waters edge or sit in the wood fired hot tub and star gaze. We have trails that we are slowly developing on our 230 acres for hiking in the summer. In the winter enjoy snowshoeing on the trails, not suitable for cross country skiing. Pets, yes we allow pets that have been treated with a flea product and well behaved. This guarantees that we can continue to allow pets. Getting There: We are 30 minutes from downtown Ottawa in the Perkins sector of Val des Monts in the Gatineau Hills of Quebec. In the summer you would meet us at the trailhead which is the parking area in the middle of the forest on our gated 230 acre property. (will provide directions & details once you are booked in). With our ATV we will bring your things in to the lake and then canoe 300' across the small lake to the cabin. For you it would be a ten minute walk and a 3 minute paddle across If you have a dog you can also take (literally) the deer trail up and down and around the lake. this trail would take another 6-10 minutes. ﻿IN THE WINTER ﻿ you park at our home which is 1 1/2 km away and we take you to the cabin via skidoo on a packed trail through the woods from behind our house or you could walk or snowshoe in. When you are ready to leave the cabin, we will pick you up. Part of the winter rental is delivering your gear to the cabin, having the fire set for you in the morning before you arrive to take the chill out, as well as filling up the wood fired hot tub with fresh spring water and setting the fire for you. Getting you there during freeze up and thaw....yet another element of adventure, typically mid November and mid March, depending on our unpredictable weather. When this happens we go around the lake. At the end of the lake where the water exits there is a small stream with a 16' foot bridge that is 2' wide where you can cross onto the Deer Trail. This narrow trail goes along the lake, up and down to the cabin. I will let you know when this might be the case. A few times in the winter there will be a couple of ice fishermen that will come in from the north end of the lake from another property and do some fishing, they stay at the far end of the lake, there is nothing I can do about this if it happens so dont be shy to go and check out their catch.....they have been know to offer a fish. You would be all alone, in a log cabin by a crackling fire in the middle of the forest by the lakes edge..........in a wood fired hot tub.... now how perfect is that!!! Lone Wolf Cabin N﻿otes..... A must read if you are staying at the cabin to help familiarize yourself. Lots of information :) A copy is at the cabin. If it is a true "Getaway that you want" and dont want to bother leaving it the way you found it which includes draining and cleaning the hot tub you can pay an extra $65 cleaning fee, this needs to be booked ahead of time. To help you familiarize yourself with our sauna, lots of pictures, click on the above link. When you reserve the cabin please read the Lone Wolf cabin notes above to help familiarize yourselves with this unique property depending on the season. Interior Cabin Movie 5 minutes, taken Jan. 2011.